July 30, 2017 – East Dorset, Vermont-Failenn Aselta, 15, of Weston, CT, won the $1,500 Marshall & Sterling Children’s Jumper Classic on Sunday, July 30, to cap the fourth week of competition at the six-week Vermont Summer Festival, running through August 13 at Harold Beebe Farm in East Dorset, VT.
From a starting field of 14, three horse-rider combinations advanced to the jump-off over a track set by Canadian course designer and 1976 Olympic individual silver medalist, Michel Vaillancourt. Fractions of a second determined the top two placings with Aselta piloting Lady Plane to the victory with a clear effort in 36.50 seconds over Alle Durkin of Natick, MA, who stopped the clock clear in 36.75 seconds riding Caherconree Cooley for second place. 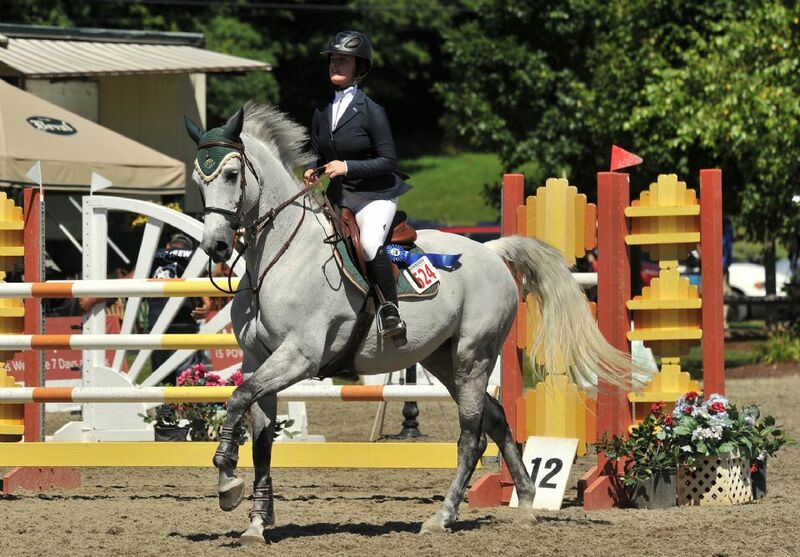 Failenn Aselta of Weston, CT, won the $1,500 Marshall & Sterling Children’s Jumper Classic riding Lady Plane on Sunday, July 30, at the Vermont Summer Festival in East Dorset, VT.
Tessa P. Brown of Jamaica, VT, finished third riding Athletic Lady after incurring eight faults in the jump-off. Mary McDaniel of Fredericksburg, VA, posted the fastest four-fault effort in the first round riding Wing Man to take fourth while Elle Haymond of West Hartford, CT, also picked up four faults in the opening round riding Equifit Zaretta to round out the top five. Aselta got the ride on Lady Plane for the 2017 Florida winter season and officially added the nine-year-old Canadian-bred mare to her string in June after retiring her main jumper mount. “I automatically fell in love with her,” said Aselta, who rides with Amanda and Juliana Starbuck of Starbuck Equestrian based in Ridgefield, CT. “When we did our first show at the Winter Equestrian Festival I learned that she is not an easy horse to ride and I really had to become a better rider. Aselta has been competing at the Vermont Summer Festival for ten years, noting, “I started coming with my small pony and Amanda has brought me up the ranks showing here. 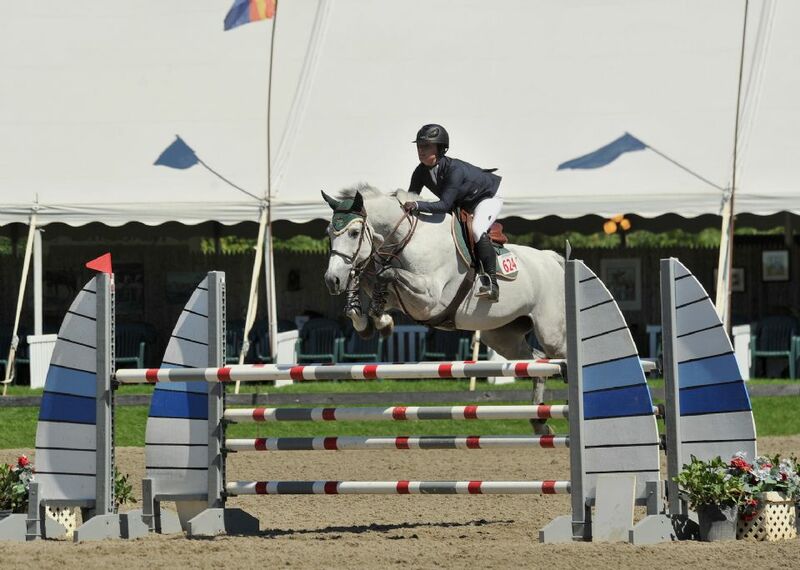 “The show grounds are gorgeous, the rings are always well-groomed, and there are so many great things to do in the surrounding towns,” continued Aselta, who will begin her junior year at St. Luke’s School in New Canaan, CT, this fall. Failenn Aselta and Lady Plane enjoy their victory gallop as the winners of the $1,500 Marshall & Sterling Children’s Jumper Classic at the Vermont Summer Festival in East Dorset, VT.
Also on the final day of week four at the Vermont Summer Festival, Elizabeth Rae of Bernville, PA, won the $2,500 Marshall & Sterling Adult Amateur Jumper Classic riding Herault. Elizabeth McKim of Wilmington, NC, topped the $5,000 Low Junior/Amateur-Owner Jumper Classic riding Airbrush and received a pair of Tonic paddock boots and half-chaps from Schockemoehle in recognition of her win. Closing out the day, Alison Cooney won the $10,000 Show Jumping Hall of Fame High Junior/Amateur-Owner Jumper Classic, presented by Miller & Associates, riding Comeback de la Manade.